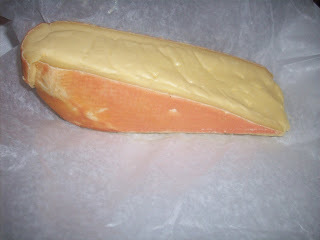 Grayson is a New World cheese that is modeled after the Old World cheese Taleggio. I find Taleggio to be a milder cheese, while as I've described, Grayson is a big burly cheese. A lot of American cheeses are inspired by Old World cheeses. 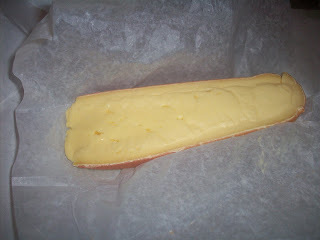 Bonne Bouche from VT Butter & Cheese Co. is a tastier (in my opinion) version of the French Selles-sur-Cher. This has happened for a few reasons. First of all, this country is culturally speaking, a melting pot. Many American citizens have roots that can be traced to other cheesy parts of the world. When their ancestors came here, they brought their talents and knowledge with them. In addition, many cheesemakers go to Western Europe to learn how to make cheese. They bring those skills back and turn out American cheeses that are inspired by their travels. The next time you're thinking about a cheese that's European, ask your cheesemonger if there's an American cheese similar and try them both. Compare the look, feel, smell and of course taste of the cheeses. You might find a new cheesy friend. Labels: Bonne Bouche, Grayson, Taleggio, VT Butter and Cheese Co. I did this completely unintentionally, but the past two posts (Taleggio and Grayson)have a connection. Yes, they are both square cheeses. Yes, they both got me a double seat to myself when going home on the bus. And yes, they are both delicious. They have another connection. A very interesting one. The first person to email me the correct answer wins.....a......um......well, I dunno. My admiration and respect? A pony? No, no ponies. You will win my admiration and respect, not a pony. What are you going to do with a pony anyway? I will post the answer by the end of day (CST) on Monday. Sometimes being the UPS man is HARD job. When we get our cheeses shipped it's usually through UPS or Fedex. I mean, do you want to trust the USPS with something perishable? Really? Well, the other day the UPS man came by to bring us some lovely cheese. Some lovely stinky cheese. 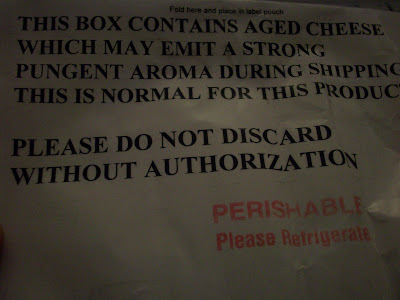 It seems that this cheese is so stinky that it comes with it's own disclaimer and warning for the UPS man. What is this cheese? This monster fromaggio whose smell would have the UPS man think "something here has gone horribly wrong". It's Grayson from Meadow Creek Dairy in Virginia, and it's really not that scary. This cheese was the second place best in show winner at last year's ACS competition. Grayson, (a Taleggio inspired American original) is a creamy dream come true. Yes, it has a hoof. The last batch we had smelled like a whole bunch of hooves. But once again, the paste isn't as strong as the rind. 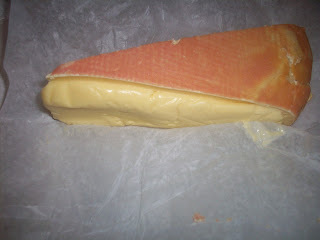 When I taste this cheese I get a milky, slightly sour, beefy (it is a raw cow cheese after all), green flavor profile. When I say green, what I'm trying to say is that it tastes like the animals were eating in the pasture and that milk was used for the cheese. It does not taste like a Shamrock Shake. Store it wrapped in wax paper or cheese paper. Then into the crisper. This cheese should be eaten within a few days. If you don't, eventually the Grayson will remind you that it's still in your ice box. If you are going to turn the Grayson into a hot dish and you live in a tiny studio apartment, go to your brother's house and offer to cook something. People love it when you cook for them, and no one ever thinks to ask if what you're cooking will smell like hoof two days later. When your brother says "Whoa. What's that smell?" tell him to shut up or you'll tell ma that he's bothering you. Sit around the dinner table enjoying the creamy, ooey, melty, creamy tasty goodness. If you do not have a brother, a close friend will do. Although, #3 is not going to make as much sense. I'm so well acquainted with the smell, that I don't always notice it. I grabbed a chunk on my way out of the cheese shop today. I forgot that I took the bus to work. Even though the bus was full, near bursting to capacity, I had a whole two seat row to myself. Behold the smelly power of Grayson! I wish we had smell-o-net. You guys would love it right about now. I love this cheese. The creamy texture, the cow-y smells and tastes. This is scientific proof that good things come from VA.
Oh Yum! Ooey Gooey Yum.